Parent Meeting: February 10, 2019 following the 9:00 a.m. Mass in the church. Meeting for parents and children to be held in the Church. At least one parent must attend. Attendance at Mass is the best way to help your child prepare for life as a practicing Catholic. You are your child’s first teacher and we are here to support what you are doing at home. First Communion Retreat: Saturday, April 13, 2019. to be held in the Parish Center. This is a great chance for the children to enjoy each other as we help them to prepare for the importance of the Sacrament of First Holy Communion. The Children will meet in the Parish Center at 9 a.m. Parents will join the candidates for lunch at 11:00 a.m. in the parish center. The retreat ends at 12:00 p.m. All candidates are required to attend this Retreat. First Communion Practice: Thursday, May 9, 2019 from 4:00 p.m. until 5:30 p.m. in the Church. Church attire is appropriate. All candidates are required to attend this Practice. Sacrament of First Holy Communion: Saturday, May 11, 2019 at 9:30 a.m. in the Church. Individual Pictures will be taken at 8:30 a.m. and the group photo will be taken at 9:00 a.m. Children should arrive no later than 8:30 a.m. Boys: Dress pants(khakis are fine), dress shirt, and tie. Boys are welcome to wear a suit but it is not mandatory. No Sneakers. Girls: First Communion dress(white dress) and veil is the standard, but optional. 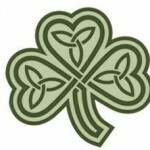 Veils are available locally at Saints and Shamrocks. Please do not let dressing your child for these events be a burden for your family and if we can help in any way, please let us know. Individual and group photo will be offered at First Communion. Beacon Photography will be here and will offer a reasonable professional photo. Picture forms will be available at practice. Please complete the Information form and return it ASAP. 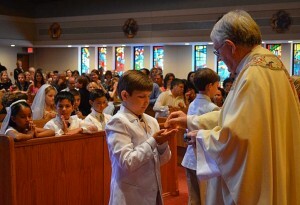 If your child was not Baptized at SPA, please return a copy of your child’s Baptismal Form ASAP. 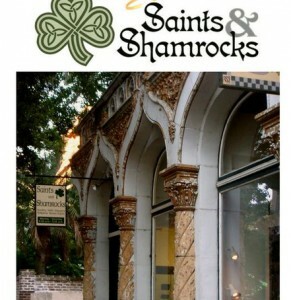 Saints and Shamrocks (309 w. Bull St.) is a great place to pick up a special gift for these occasions.